My latest obsession over the past year or so? Overnight face masks. I love slathering them on and waking up to clear, soft, radiant skin. And when it's the First Aid Beauty Facial Radiance Overnight Mask? Well, that pretty much means I'm guaranteed to fall immediately, head over heels in love. In the past, I've tried overnight masks by Kiehl's, Clinique, Origins and Korres. And I definitely still stand by my glowing (pardon the pun) reviews of every single one. But using this one by First Aid Beauty? Well, I feel like I've died and gone to skincare heaven. For starters, the formula is unbelievably lightweight. It sinks into the skin directly upon contact and doesn't make you feel greasy. But what I really love is the gel cream consistency, which is what really sets this one apart from others in the market. While the rest have a heavier texture similar to overnight cream, this one just feels like a more powerful version of your daytime moisturizer. And when I wake up in the morning? Regardless of if I've had a decent night's sleep, this mask makes it LOOK like I did. My skin is glowy, hydrated, refreshed, rejuvenated, smooth, bright ... basically, it looks like I got a facial, but all I did was slather this miracle worker on and go to sleep. "Face"-ing the day? It just got a whole lot easier. 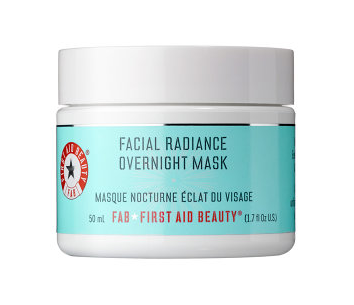 The First Aid Beauty Facial Radiance Overnight Mask retails for $38 at sephora.com. This mask sounds divine. I love that it sinks in immediately-- which is a must for me if it is being applied right before going to bed. I will definitely put this on my list of masks to try! Thank you for such a lovely review! Thanks so much for your kind words! :) I definitely recommend it. It's a lot different than the other overnight masks I've tried! You got me at "gel cream". I love that consistency. I bought the First Aid Skin Cream a couple of months, and I am not sure what to do with it! I thought it might be a super-hydrator, but it's kind of normal. Right? Gel cream is the BEST! I use the First Aid Skin Cream more on my body than my face actually. I like to use it on rough patches like elbows and knees! ME TOO!! They're my favorite skincare brand for sure. It sounds like a miracle worker! Must have it! Yes you must! FAB products are always miracle workers. I've never used an overnight mask before! I'm definitely intrigued. Gonna check this out! You'll have to let me know what you think! Overnight masks have definitely become my new skincare go-to. I've never tried an overnight mask before! You'll have to let me know if you do! I love to try something like this ! Sounds dreamy! I've never tried an overnight mask before! It is! :) You'll have to let me know if you try it. I've used overnight masks too, and they are great. Yes they are! I love how great your skin looks and feels in the morning. Oooh! What's the Vichy one? That will be next on my list! This sounds really cool... overnight? Hmmm.... I never tried an overnight one but it sounds cool. Yes overnight! They really do make your skin feel so soft in the morning. An overnight mask sounds really interesting, never tried one myself! But who could say no to hydrated, well rested skin? Um ... no one? :) I definitely recommend it! I havent tried this, though I should.